The summer has finally started to show itself and that means farmers’ markets season! As Cape Cod starts to bustle with visitors and seasonal businesses start to open, our friends at all the local farmers markets gear up for a busy couple of months. 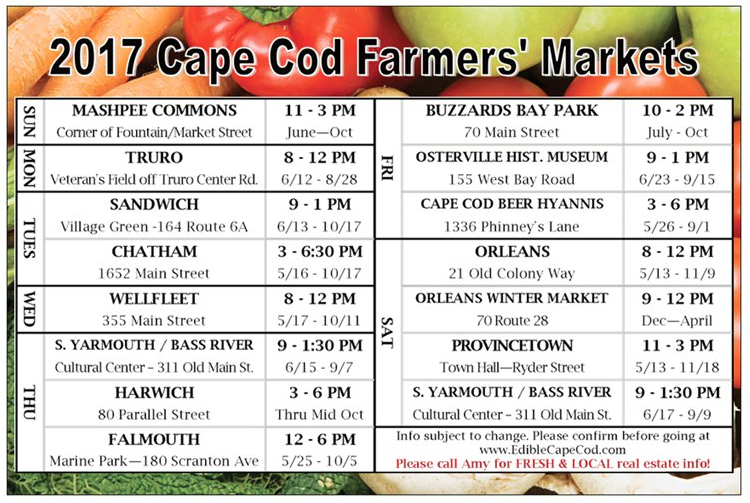 Did you know there are farmers markets open every day all over Cape Cod? You can get farm fresh, local produce from Bourne all the way to Provincetown. And if you’re in the mood for a little more fun, you can check out Farmers’ Market Meets Happy Hour over at Cape Cod Beer in Hyannis. PLUS, the Brewster Historical Society will be hosting a farmers’ market at Drummer Boy Park on Sundays this summer! Check out the vendors they have lined up! Click to read the Top 5 Reasons to Support Farmers’ Markets over at freshfarm.org and be sure to visit www.EdibleCapeCod.com for updates on your favorite farmers’ market’s schedule. Local real estate is also ripe for the picking… it’s time to buy or sell before interest rates climb higher! Please call or write to explore your options! Enjoy the harvest!